The quintessential sounds of the Seventies are here in the most wide-ranging collection of AM radio classics ever heard on a single disc! Hard to Find 45s on CD, Vol. 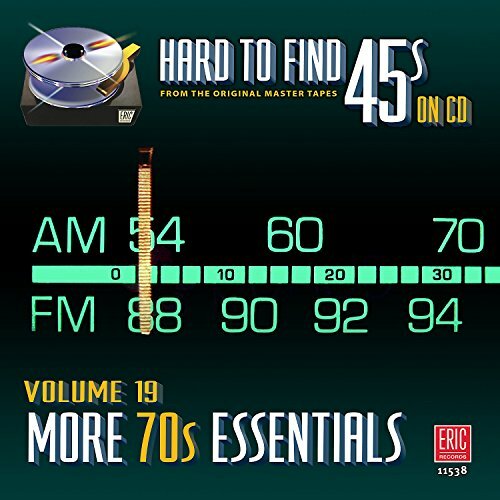 19: More 70s Essentials has 21 beautifully remastered stereo songs, 11 of which were Top 10 hits and five of which appear on CD for the first time ever! In a word, it's dy-no-mite! These rare hits include Kermit the Frog's "Rainbow Connection" - the Muppet Movie theme that became a surprise Oscar nominee & Top 40 hit in 1979 - and Timmy Thomas's one-of-a-kind Top 3 hit "Why Can't We Live Together," never in stereo until now! After 45 years, finally making their CD debuts are The Neighborhood's "Big Yellow Taxi" - the first hit version of the famous Joni Mitchell song - and the Sugar Bears' "You Are The One," a bright ray of sunshine pop that features a young Kim Carnes on background vocals. The collection runs the rock-and-roll gamut, from the folk-rock of Joan Baez's "The Night They Drove Old Dixie Down" and Arlo Guthrie's "The City Of New Orleans" to the horn-driven rock of "Vehicle" by Ides Of March. And from the slinky glam-rock of T. Rex's "Bang A Gong (Get It On)" to the lovers' rock of Gerry Rafferty's "Right Down The Line." Every facet of 1970s popular music is presented in crystal-clear fidelity! Eric Records' #1 goal is to preserve for future generations specially selected pop music gems in the highest possible quality before the original hit sources are lost to time and decay. No other label puts as much care and effort into providing the correct versions of the original hit singles you remember, remastered for remarkable clarity. This CD is a great value, too - over 71 minutes of STEREO hits that aren't available in audiophile quality like this from iTunes and Spotify (if they're downloadable at all! ).